Meekyoung Shin who is working in Seoul and London, uses ‘soap’ as a main material to aim unique reinterpretation of her work. In a specific image of ceramics and Buddhas, the work embodies her “translation” of the various religious, historical, and cultural issues that she experiences as an Asian artist in the 21st century. Her reinterpretation is then “translated” by viewers of a distinct religious, historical, and cultural context in which they live and experience. With such everyday material as soap, Shin’s work deals with penetration between civilizations, transference, questions of originality, copy, and replication. Shin’s soap sculptures take the same forms of the original sculptures, but possess the completely different historical and cultural contents and present the new contexts. 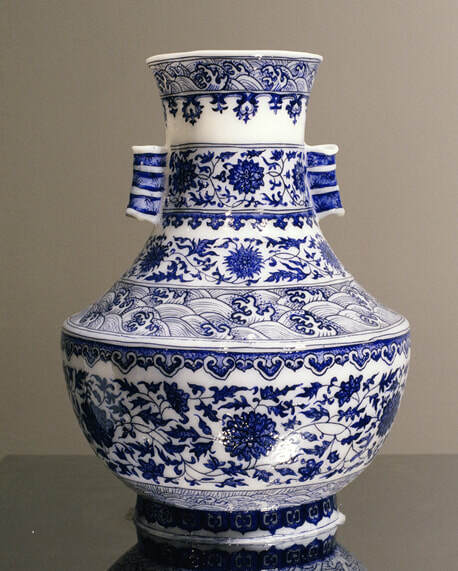 In Translation-Vase, the artist represents a Chinese decorative ceramic, sculpting it from a block of soap, making incisions, filling in, and painting them. The artifacts created by the artist, as they move between Korea, China, and Britain, encounter audiences and are understood in different ways depending on their cultural backgrounds and levels of comprehension. Artifacts are functional things which were used by people but, after their cultural values were discovered and moved into museums, have become untouchable objects. Shin is interested in the temporal pause that takes place in this process. Her Translation-Toilet Project consists of soap Buddha statues that were used by audiences in the toilet and then brought back into the gallery; at this point, the process of “artifactization” stops. The soap statues in the toilet stimulate functionality, decorativeness, and audience participation. At the same time, they generate their own provenance and are to be understood in divergent patterns according to each culture, religion, or gender.